During this class, students will learn how to use the Regalia long arm quilting machine. Students who have never used the machine will learn the basic steps to free-motion quilting including how to load a quilt onto a long arm quilting frame, how to operate the machine and techniques for a basic free-motion meander, swirls and shapes. 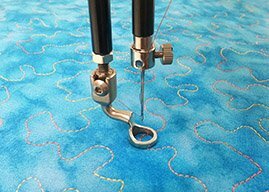 Additional classes may be scheduled to learn more advanced quilting techniques such as Pantographs, stippling, ruler work and other custom quilting techniques. * Note: students should not wear any perfumes or scented body lotions on the day of class due to extreme allergies of Block Therapy customers and personnel. *Batting, Backing and Thread are available for purchase at Block Therapy Quilt Shop.